Just when we’ve started to get a grip on our new year’s resolutions we are hit with one of the biggest calorie feasts of the year: The SUPER BOWL. 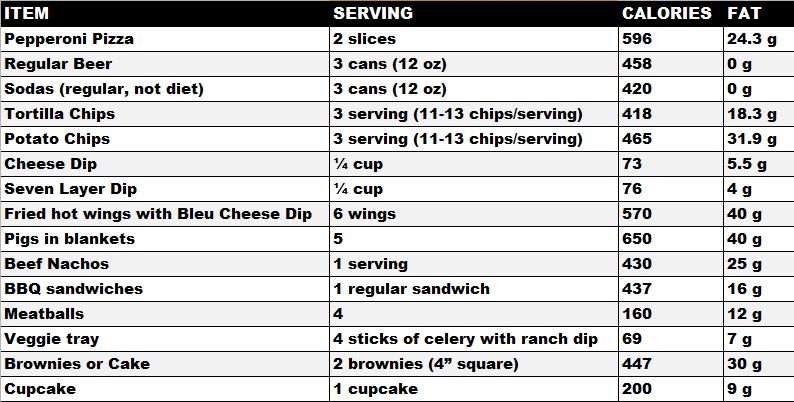 The U.S. Calorie Control Council estimates that Americans pack away 11 million pounds of chips on Super Bowl Sunday. Holy cow America! What’s a girl (or guy) to do? You eat all of that and you’ve consumed well over 4,500 calories! Don’t eat like a linebacker this weekend pleeeaasee. Chose some of my favorite skinner versions instead! Combine all ingredients and bake at 350 for about 12-15 minutes. With 25% of your dietary reference intake (DRI) of calcium you can’t go wrong! There is nothing I love more than loaded nachos! Reduce the calories with these simple swaps! Top Food Should Taste Good Multigrain chips with low fat cheddar cheese, albs ground beef (cooked), chili powder, paprika, tomatoes, olives, and avocado. Microwave for 1-2 minutes until cheese is melted then top with greek yogurt instead of sour cream! Turkey burger sliders wrapped up in lettuce leaves. Bake burgers for 10 minutes on each side or until cooked through. Serve each patty garnish with tomato, avocado, ketchup or mustard. Fill a platter with a variety of fruits and vegetables such as celery, carrots, red peppers, mushrooms, olives, strawberries, grapes, and offer a variety of hummus dips on the side. And there you have it! Your healthy survival guide for Superbowl Sunday! I’m a NY native but am a happy current resident of Boston, MA. I recently became an RD and am studying to be a Sports Dietitian. I insist on olive oil and balsamic on every salad, and ice cream post-meals and snacks. Sometimes I am successful; sometimes I fail miserably at my goals. I am a Crossfit enthusiast and marvel at the ability of these athletes. I like a good challenge and therefore I enjoy 10k’s, Spartan races, you name it. I’m obsessed with cupcakes and anything sweet for that matter. I hate to cook but insist that my boyfriend cook paleo meals for us every night (he enjoys it!). I truly appreciate a bold glass of Malbec wine. This is my very first blog- though I've thought about writing one for awhile. I love to brunch and am a huge foodie so this is mostly what you’ll be reading about on my blog. Hope you Enjoy!